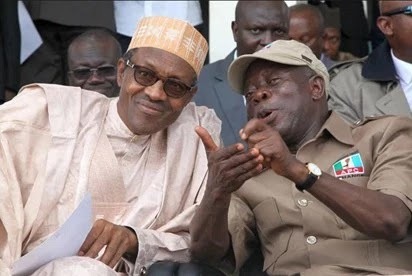 Home / featured post / Let Us Be Patient With Buhari, Oshiomhole Tells Nigerians. Let Us Be Patient With Buhari, Oshiomhole Tells Nigerians. BENIN CITY- GOVERNOR Adams Oshiomhole of Edo state has urged Nigerians to be patient with the administration of President Muhammadu Buhari, saying that it will take some time to fix the nation’s economy which according to him was battered by the Peoples Democratic Party (PDP) for 16 years. Oshiomhole made this appeal shortly after Lagos lawyer, Femi Falana (SAN), hinted jokingly, while delivering a lecture at the 60th birthday celebration of the Secretary to the Edo state Government, Prof.Julius Ihonvbere, that he may soon embark on a probe to review the performance of President Buhari. However, Oshiomhole who acknowledged the current difficulties being faced by Nigerians asserted that the APC led government in the country is working round the clock to find solutions to the problems. The governor said: “Changes takes time, not only in the life of a person but more also in the life of a nation. This a country that was run down for 16 years by PDP. And working side by side, we have cleaned up the political space. “Even now that the umbrella has turned into three pieces, they are still boasting. When Edo was under one man’s rule, those voices were loud, they would have told you whether or not there is vacancy in Osadebey Avenue. As you can see working together, strategizing together, mobilising together, for refusing to agonise we are standing and they are down. “There is no way I would have been able to achieve all these without the encouragement that you (Ihonvbere) have always readily offered, in a moment of doubt when we are strategizing” he stated. Expressing his gratitude to Oshiomhole for “saving me from that wicked hands of the PDP in the state” Ihonvbere said “ I will continue to say that the courage he (Oshiomhole) has deployed in repositioning and refocusing Edo state is unparalleled. “The next governor has a lot of work to do because to meet the standard already met requires 24 hours attention. But the good thing is that the Comrade Governor will not be too far away to assist with his advice” he said.